Vertex Pharmaceuticals Inc. is closer to being able to sell its third drug to treat cystic fibrosis. Vertex Pharmaceuticals Inc. released data from a pair of late-stage clinical trials Tuesday that put the Boston biotech on track to gain its third cystic fibrosis drug approval in six years and begin a final push toward offering treatment options for the vast majority of patients worldwide who suffer from the lung disease. Both studies show statistically significant improvement in two different sets of CF patients, including one group — those with copies of two different disease-causing genetic mutations — for which there aren’t any medicines. Patients in both studies were given a combination treatment that includes ivacaftor — already approved by US regulators and sold by Vertex under the brand name Kalydeco — along with tezacaftor, a compound that’s called a “corrector” because it works to fix a malfunctioning protein. 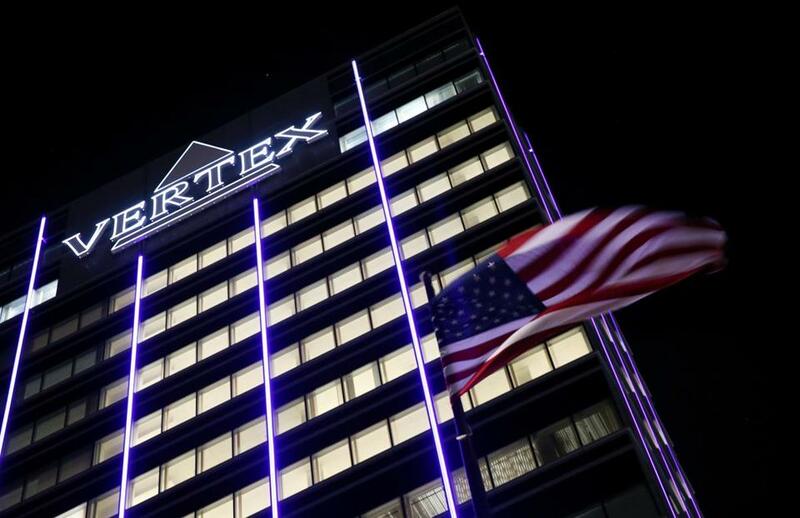 The findings were so strong that Vertex, the second largest Massachusetts-based biotech, plans to apply for Food and Drug Administration approval of the combination medicine some time in the third quarter of this year, company executives said. Vertex’s two approved drugs, Kalydeco and Orkambi, treat only about 29,000 of the estimated 75,000 people worldwide with CF. To treat the rest, the company is developing new combination drugs that can work effectively in sets of patients with different genetic defects. This new combination would benefit about 1,500 people age 12 and over, called “residual function” patients. Each of them have one of about 20 rare genetic defects along with the so-called F508del mutation that is common in other CF patients. The combo drug could also treat several thousand other patients in the United States with two copies of the F508del mutation who started taking Orkambi — the drug that targets the largest set of CF patients — but were unable to tolerate it. Potentially more significant is the boost the clinical results gives to Vertex’s plan to field a new class of so-called triple combination medicines that could help the largest remaining segment of untreated patients. The company last year began testing four different drugs that, together with ivacaftor and tezacaftor, have the potential to treat another 24,000 patients globally. One of the studies Vertex detailed Tuesday, called Evolve, enrolled 500 patients with two copies of the F508del mutation. For 24 weeks, some took the combination therapy and others were given a placebo. The second study, called Expand, enrolled 250 of the “residual function” patients. Over eight weeks, some of them took ivacaftor alone, some got the invacaftor-tezacaftor combination, and others received a placebo.